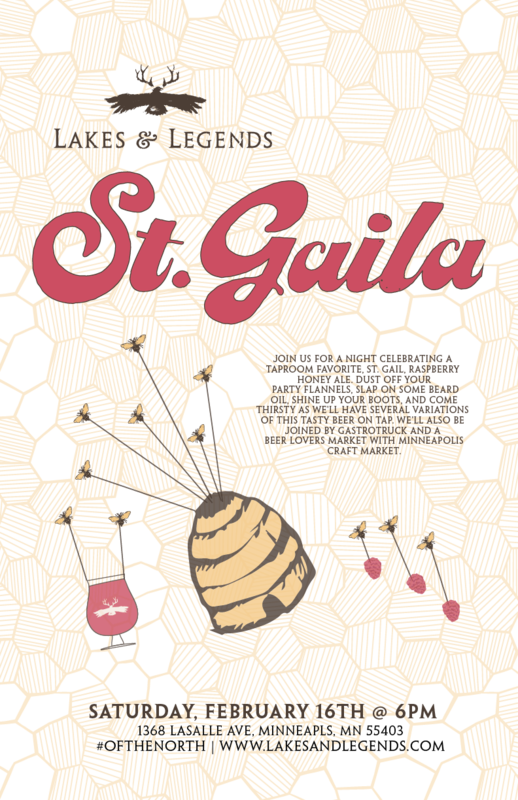 Join us Saturday, February 16th as we debut the first-ever St. Gaila (pronounced “gey-luh”) in celebration of our taproom favorite, St. Gail, raspberry honey ale. We’ll be releasing four flavor-forward infusions of our classic St. Gail that will be sure to impress. Keep an eye on this event page for more beer specifics! Gastrotruck will be serving up a complementing St. Gail menu while Minneapolis Craft Market brings a beer-lovers market to the taproom. We’ll also be hosting a Best Dressed Contest with a St. Gail Growler Pack grande prize. So dust off your fanciest flannels, slap on some beard oil, shine your boots, and come thirsty as we’ll have much to celebrate in St. Gaila fashion. Festivities begin at 6pm and go until midnight.